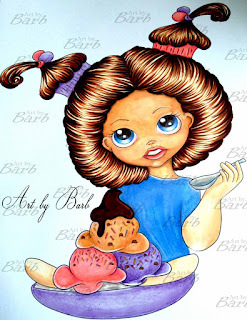 Art by Barb: How to become a confident hair colourist in just 10 years! How to become a confident hair colourist in just 10 years! The first image I coloured was a Tilda stamp, the finished colouring was flat and lifeless. I was so disappointed with myself, but posted the pic online anyway, along with a negative status. A lady answered with encouragement to keep going (at this point I was ready to throw in the towel) for some reason I decided to carry on. I was inspired to learn how to colour by other online colourists that were further a long the line of their colouring experience. I wanted to be as good as them and be able to add depth of colour in order to bring an image to life. So when you read or are told not to compare, well my advice is do compare and use the comparison to be inspired by those colourist and remember they are only further along the road than you, it's up to you to catch up with practise and the desire to become a better colourist. Don't get hung up on techniques. Colourist develop their style over many, many years. In my experience it is so difficult as a beginner to master their technique straightaway, All I seemed to do was set myself up for a fall, which filled me with too much frustration. Eventually I came to accept that I was at the early stage and needed to give myself the time to learn and develop my own style. Watch youtube vids, especially colouring hair with coloured pencils. In my opinion these ones will help you to achieve a better understanding of the flow of hair and how to define hair. To help define strands and sections of hair use a coloured pencil after using markers. Markers and pencils work so well together and you'll be happier with the end result. Practise is important to build up muscle memory, the more practise you do, the more the mind remembers the action and if you keep practising, one day you'll have a Eureka moment and think "By jove, I think I've got it!" Join me at Art by Barb group, where you can collect this free image and sentiments. Ask me and my members for helpful advice and tips about colouring. Come Join in the fun! Thank you for those words of wisdom. You are exactly right in what you say and I think it is good to stretch yourself and have a goal to work towards in your coloring weather you be a beginner or a more experienced colorist their is always more to learn and we can learn off each other.